We stock Japanese paring chisels by both Nashiki and Iyori. The former are superb, thin, easy to sharpen, and hold an edge. The Iyori chisels have a triangular section that makes them stiffer, but also easier and less expensive to make. 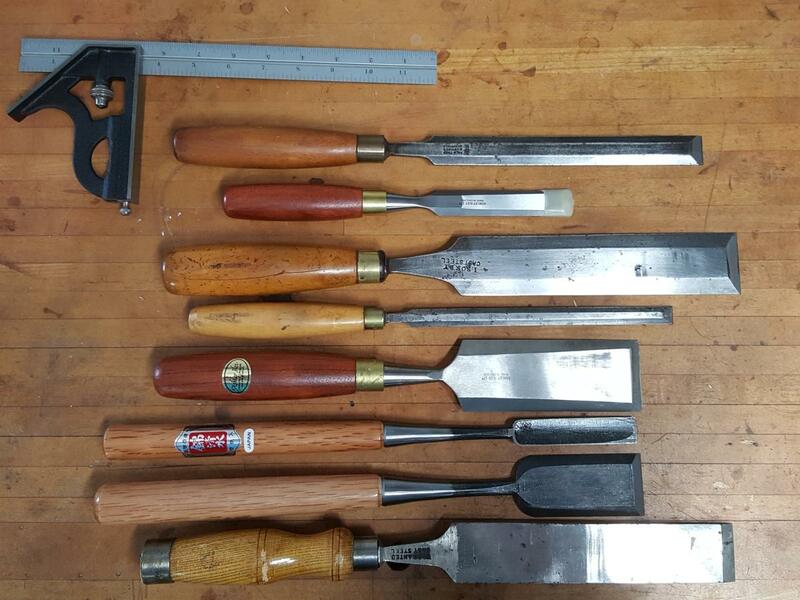 In the first photo from the top: Paring Chisel, Ashley Iles Beveled Edge Bench Chisel, 2 more paring chisels, 2" Ashley Iles Bench Chisel, 2 Nishiki extra thin paring chisels, and a Registered Chisel. 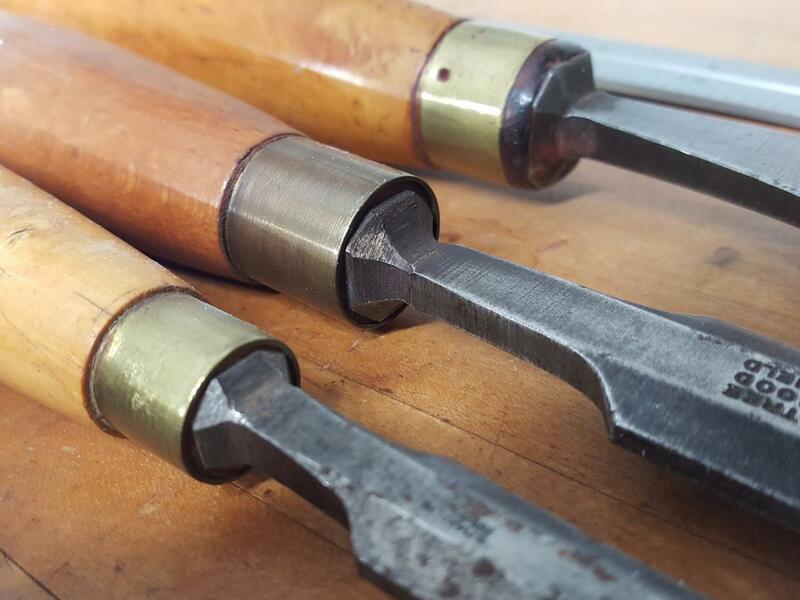 Although not true paring chisels, the "Round Back Dovetail Chisels by Ashley Iles" work very well for paring and I find them very comfortable to hold. Be nice to get them wider than 1". Thank you for a well written, informative article! I can highly recommend the paring chisels made by Dave Jeske at Blue Spruce Toolworks located in Portland, Oregon. I have a couple of Henry Taylor "Long Thin Paring Chisels" that I purchased only about 2 years ago. But I have never gotten a chance to use them yet. As i said at the begining of the blog you can pare with anything. Including both Henry Taylor or Blue Spruce paring chisels. Both are fine chisels, just not in the same league as the no longer made, much longer, thinner, nicer forged, lower angle English antiques - if you can find them in good condition and at full a length as possible. The best paring chisel you'll ever use is an 8mm (maybe 12, depending) No. 1 sweep fishtail. I have 4 of the Sorby paring chisels (1/4, 3/8, 1/2, and 3/4 inch). I really likes them for trimming the bottoms of dados in carcass sides - but not for dovetails - for that, I use my Ashley-Isles dovetail chisels. These are, essentially, a short paring chisel with a modified side-grind. 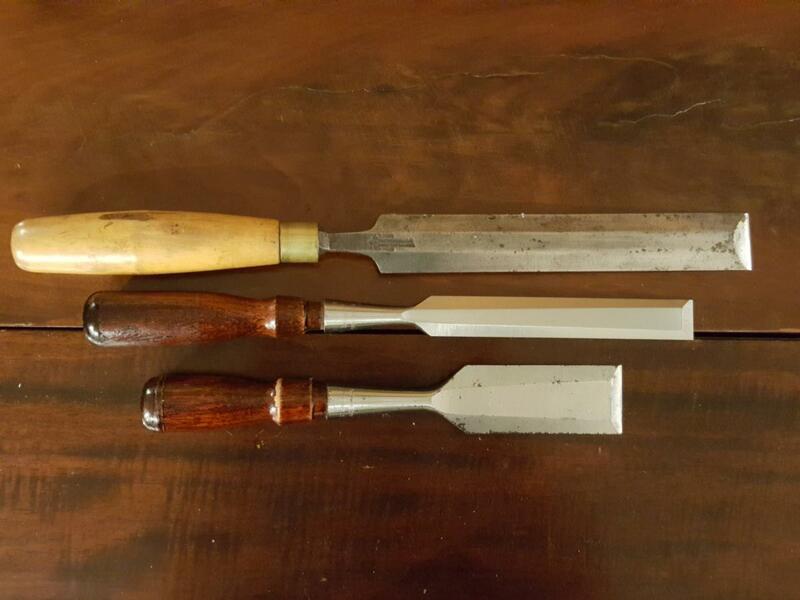 I have 3 sizes of the Sorby paring chisels - 1/4, 1/2 and 3/4. The two smaller sizes I ordered thru Amazon (provided by a 3rd party in Ohio). Both were received with a distinct bow in the blades (beveled side concave). Don't know if this happened in transit or came that way from the factory. 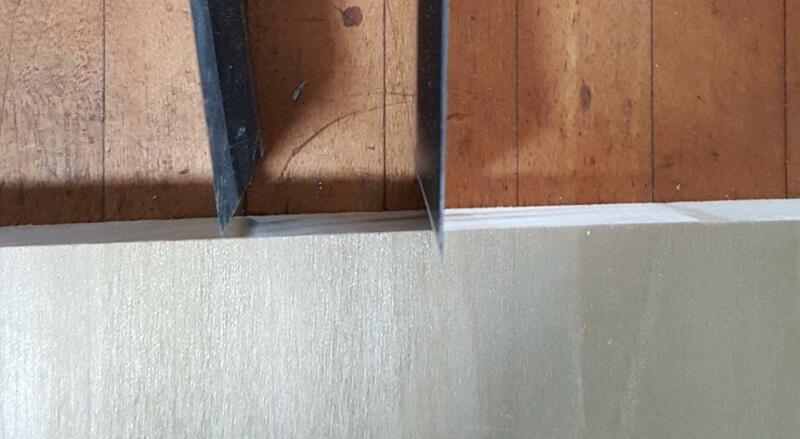 Both cutting edges looked like they had been formed with a hatchet which is probably a reflection of diminished QC in the UK. However, with the steel soft and thin, they cleaned up readily. Because they are so thin and flexible, the upward bending bow seems to be of no consequence, as it is easy to hold flat while paring (I pare with one hand on the blade and one on the handle). The 3/4 chisel was obtained thru LV and had less distortion. The only minor negative comment is that although it is marked 3/4 it is sized metrically and is about 1/32 wider. If you want to pare a 3/4 dado for pine obtained at Home Depot, this tool won't work. But it would work well for typical hardwood thicknesses. Back in the 80's I started as an apprentice wooden boat builder in New England. I put together my tool bag from yard sales and antique shops. Over the years since then I've collected a full set of Witherby paring chisels, from 1/8" to 2". So, Joel, if you want to see a 1/8" chisel, I'll be glad to send you a picture. I love the Witherbys, they sharpen well and hold an edge superbly. Some of them I had to turn new handles for and I used white oak because that's what we had shed's full of at the boatyard. Over time I've collected quite a few old and new chisels--registered, mortise and timber framing--along with a couple of large slicks. The Witherby's remain my favorites. Joel, have you used the Sorby paring chisels? My 1 1/2" version is quite flexible and long with wide bevels and performs almost as well as my narrower, vintage ones.